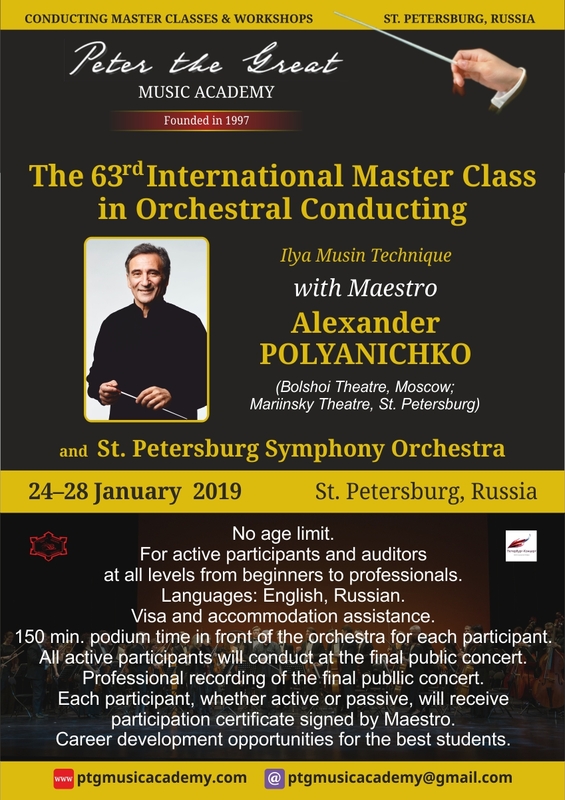 Alexander Polyanichko, an internationally renowned conductor and educator regularly leads conducting master classes in cooperation with Peter the Great Music Academy, Royal Baltic Festival, Hermitage Theatre, and St. Petersburg Chamber Philharmonic. A graduate of the Leningrad State Conservatory, and former pupil and assistant of the eminent Ilya Musin (whose students include Yuri Temirkanov, Semyon Bychkov, Valery Gergiev, among many others), maestro Polyanichko has been one of Musin’s biggest proponents, carrying on the great tradition of the St. Petersburg school of conducting. Maestro Polyanichko’s artistry, knowledge, his genuine willingness to share his experiences, sense of humor, friendly and respectful manner of communication, creates a free exchange of ideas, a spirit of collaboration as he and his students search for ways to resolve emerging issues, and a comfortable and productive master class atmosphere. Master classes traditionally consist of two parts: the first is accompanied by two experienced pianists, and the second gives students the opportunity to work with a professional symphony orchestra. The dress rehearsal preceding the concert is always open to the public, and the culmination of the master class is the final concert which is professionally video/audio recorded. During the almost twenty years of teaching master classes, Alexander Polyanichko has worked with conductors from countries around the world including Argentina, Australia, Austria, Belgium, Brazil, Canada, Chile, China, Czech Republic, Denmark, Egypt, France, Germany, Italy, Japan, Mexico, New Zealand, Oman, Singapore, South Korea, Spain, Sweden, Switzerland, Turkey, United Kingdom and the United States of America. 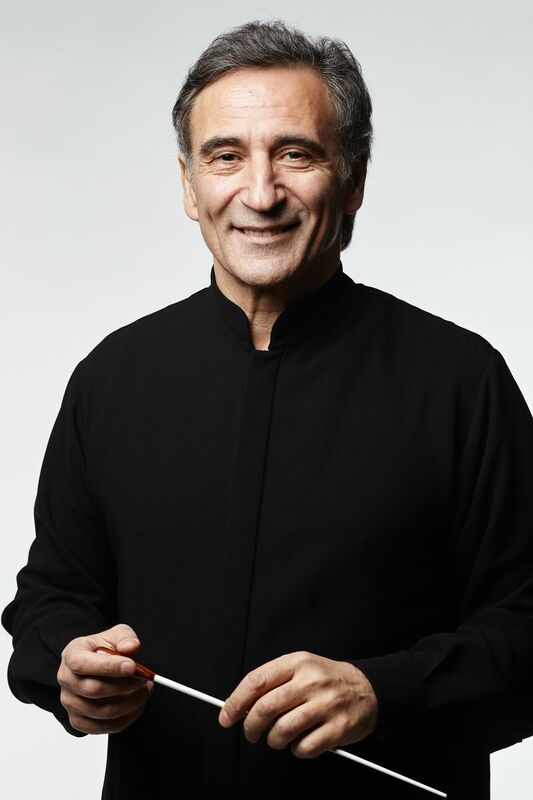 Students have consistently expressed their appreciation the pedagogical skills of Maestro Polyanichko and his master classes, and have gone on to conduct many successful performances of their own in their respective countries and beyond. As a guest conductor, Polianichko has appeared at many renowned opera houses, including Bolshoi Theatre, Royal Opera House, La Scala, Deutsche Oper, San Francisco Opera, Australian Opera, English National Opera, Welsh National Opera, Danish Royal Opera, Stuttgart Oper, Colorado Opera, Lyric Opera of Kansas City, Norwegian Royal Opera, and Swedish Royal Opera. In 1996, he was invited to take the Opéra National de Paris to New York for their appearances at the MET. Polianichko has worked with leading orchestras around the world - Saint Petersburg Philharmonic Symphony Orchestra, Russian National Orchestra, Chicago Symphony Orchestra, London Philharmonic Orchestra, BBC Scottish Symphony Orchestra, BBC National Orchestra of Wales, Royal Scottish National Orchestra, City of Birmingham Symphony, Hallé Orchestra, Bergen Philharmonic Orchestra, Danish National Radio Orchestra, English and Irish Chamber Orchestras, among many others. From 2005, Polianichko gave orchestral master classes for the Swedish National Orchestra Academy, Symphony Orchestra of the Royal College of Music, London, Chamber Orchestra of the Cambridge University, and Britten-Pears Youth Orchestra. Since 2002, he has been holding annual conducting master classes in St. Petersburg organized by Peter the Great Music Academy, the Royal Baltic festival, and the Theatre of Hermitage Museum, to which students come from all over the world. Polianichko appears at many prestigious music festivals in Russia and abroad, including Edinburgh, Aldeburgh and Savonlinna, Golden Mask, White Nights and Chaliapin Opera Festivals, and had the privilege to work with many world famous artists and singers, such as Anna Netrebko, Anne Sofie von Otter, Elena Obraztsova, Dawn Upshaw, Olga Borodina, Makvala Kasrashvili, Larissa Diadkova, Irina Bogacheva, as well as Placido Domingo, Jonas Kaufmann, Vladimir Galuzin, Ildar Abdrazakov, Sir Thomas Allen, Pata Burchuladze, Sergey Leiferkus, John Tomlinson and many others.